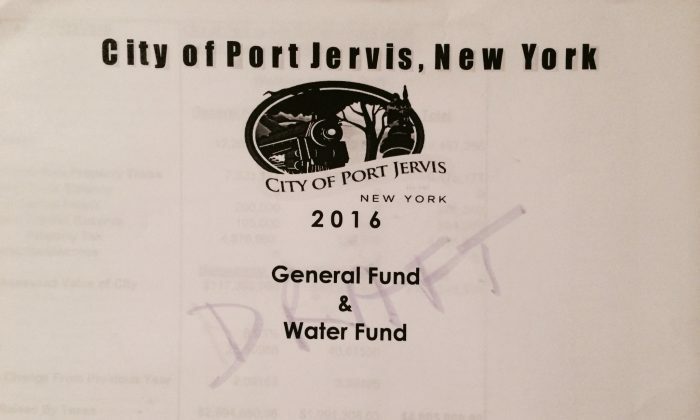 PORT JERVIS—There is good news and bad news for Port Jervis tax payers since Mayor Kelly Decker turned in his proposed 2016 city budget on Nov. 9. The bad news is that, due to a calculation error, the 14.4 percent tax rate hike in the Mayor’s proposed budget was actually 17.4 percent. The good news is that the mayor has been working with Finance Committee Chairman, Frank Bell, and City Clerk and Treasurer, Robin Waizenegger, to whittle the tax increase down to 8.93 percent. In the latest draft of the budget, there is a decrease in the hours for police dispatchers, a delay for hiring and promoting in the police department and the city clerk’s office, a cut in three positions in the Department of Public Works, a cut to funding of the city’s parks from three to one, a 6.4 percent cut to the fire department budget, a complete removal of the funding requested by the Port Jervis Volunteer Ambulance Corp., a decrease of $6,000 from the tourism budget, a reduction of transition training for new staff, fees for the West End Beach and Park for non-residents, a reduction in the non-union salary increases from 2 percent to 1.5 percent, and reduced allocation for gas, oil, and utilities to be closer to the 2015 expenses. Since then, the council has met with Recreation Department Director, John Faggione, and Director of DPW and Water Jack Farr, Police Chief William Worden, Assessor Yvonne Duryea and Waizenegger about their budgets. In response to the proposed cuts, Faggione suggested cutting the hours the parks are open instead of the number of parks, starting the summer youth program a week later and reducing its hours, and eliminating a summer youth center leader position altogether. He also asked to hire a new worker for the department to replace one that is currently assigned to the department from the DPW. Councilman Stanley Siegel proposed taking the 1.5 percent pay increase for the non- union employees and the 2 percent increase from union employees currently in the budget to zero percent for the year. This would require a renegotiation of both the DPW and police union contracts. The next budget meetings are scheduled for Monday, Nov. 30 and Thurs. Dec. 3 in the Common Council Chambers of City Hall at 20 Hammond Street.